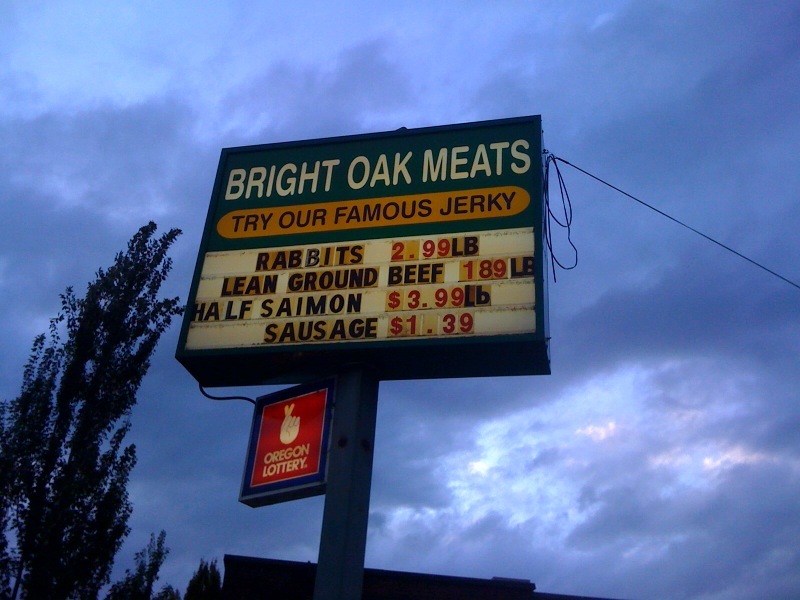 Bright Oak Meats may be known for their famous jerky, as is evident by their jerky display on this Springfield, Oregon roadside sign, photographed by regular contributor Jeremy D. Are they referring to a HALF SAlMON fillet, or lopping off half of the letter L when spelling SAlMON? I never thought I'd say this, but I think I'll play it safe and go with the rabbits instead. Don't mock us with that smiley face, Public Pool in Williams, Arizona. Confusingly placed lowercase L discoverer, Robin D, doesn't want your stinking GOGGlES anyway. Was there a three-L limit on this sign or something? 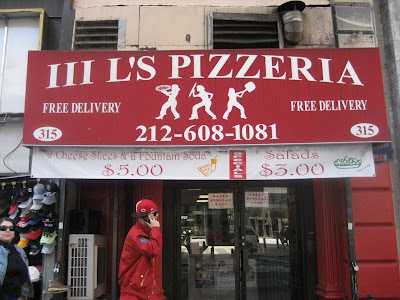 Not a lowercase L offense at all, I just thought III L's Pizzeria might like to sponsor my blog. Doesn't get much slower than dead. Not sure if this SlOW sign is referring to traffic or the person who wrote the very same SlOW sign, but this cemetery in Charlottesville, VA, photographed by Scott G. makes me want to speed up to get out of there quicker. 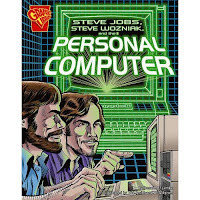 Past contributor and Macintosh fan, Jeremy D., checked a book out of the library, Steve Jobs, Steve Wozniak, and the Personal Computer , by Donald B. Lemke, to teach his kids about the origins of Apple. 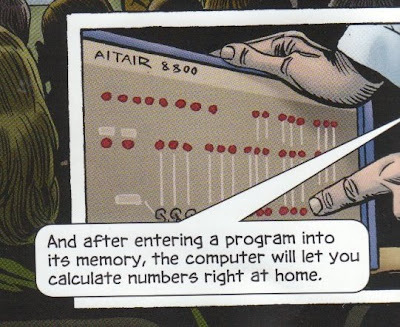 Much to his surprise, he found a very prominent and misleading lowercase L in an illustrated panel about the MITS AlTAIR 8800 Computer. Unless you have a degree in FORTRAN or happen to know the complete history of computers, you have no way of knowing that the illustrated computer isn't an Aitair. I decided to give the artist the benefit of the doubt, thinking maybe he was simply reproducing an error as printed on the actual ALTAIR 8800 computers. 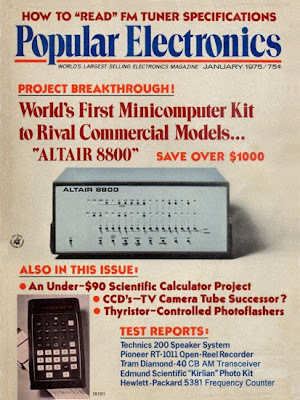 So I looked it up, and sure enough, as proven on the cover of this January 1975 issue of Popular Electronics, prominently featuring the ALTAIR 8800 with an uppercase L, there is no doubt that the artist is, in fact, insane. So many choices! 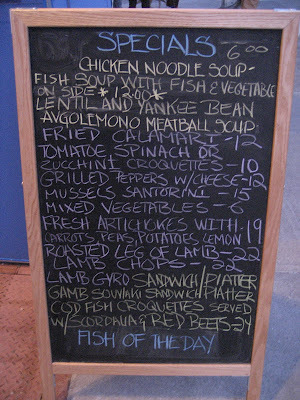 The lowercase L in PlATTER almost went unnoticed on the lower right corner of this menu board in front of Santorini Grill, a mediocre Greek restaurant in Williamsburg, Brooklyn. 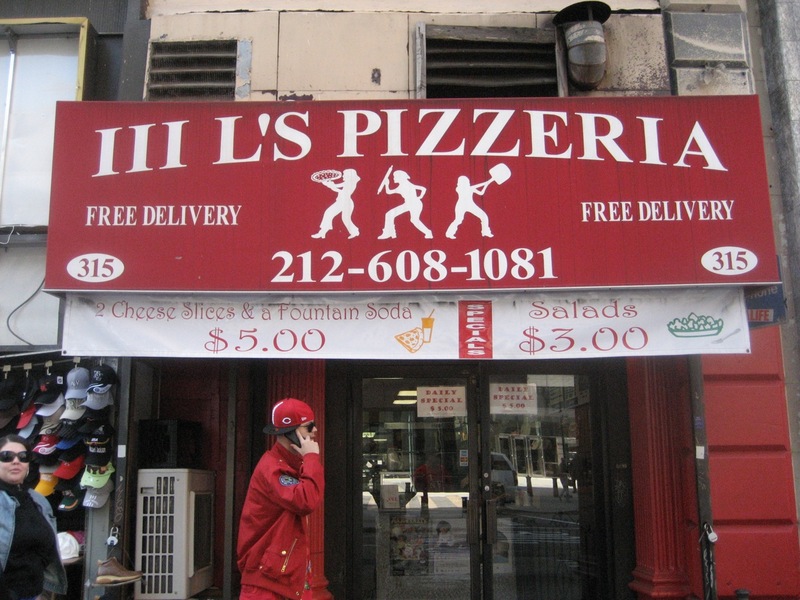 But, based on my previous experience with Greek restaurants, I knew I'd find the lowercase L offense eventually. Sweet MAlYA couldn't believe it when she learned she had been passing by this sign, unnoticed, on the Upper West Side of Manhattan nearly every day of the winter ... while going out with Mr. lowercase L himself (me!) This warning to trucks, advising them to RAISE PlOW, would have been less confusing if the OW — both letters that are the same in both upper and lowercase form — were bottom justified instead of top justified to the lowercase L. That might explain the metal scraping Malya heard out her window all winter long. My son and I were taking our recycling materials to the collection center behind a local strip mall in Canal Winchester, OH. 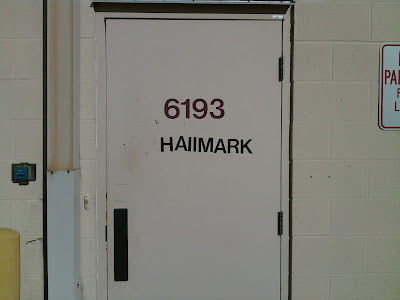 I noticed this back door to the HAIIMARK store. I asked my son to handle unloading the recyclables, because I had to snap a picture of this horror. A man's gotta have his priorities. More like a hall MAR if you ask me. There was supposed to be an A at the beginning of the first line, but it must have fallen off. 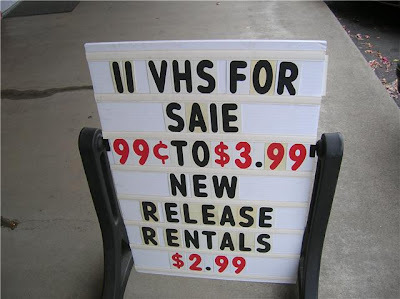 The other side of the sign said basically the same thing, plus the name of the business (ALL THE BEST VIDEO), with all uppercase Ls in their proper form. I guess this depleted their store of uppercase Ls, and they had to resort to the old uppercase I for L trick for the other side. Rimpy Rimpington strikes again, but this time not from a Home Depot. The person who arranged the individual letter pieces in this window display may have tried to TAlK-N-TEXT at the same time, apparently to no avail. 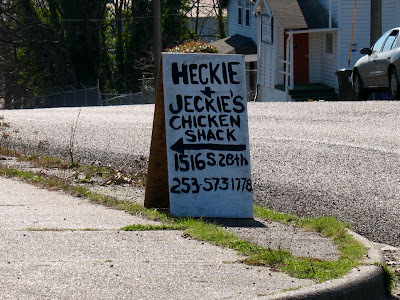 He also came dangerously close to a double lowercase L situation with the handwritten UNLIMITED CALLING on the top left portion of the sign, but managed to squeeze in a bit of the lower legs on the L's. I spotted this one on Niagara Falls Boulevard in Amherst, NY. In the summer this business sells swimming pools and during the winter they turn to indoor entertainment items such as pool tables. 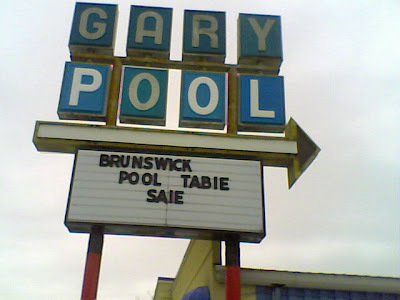 Seems that Gary is short on uppercase L's for his readerboard.